In the last decade, minimally invasive surgery has made major strides, with “incision-less” and micro- surgery looming on the near horizon. While the adoption of these advanced techniques has dramatically improved patient healing rates and recovery times, the standard opioid-centric approach to post-surgical pain management continues to diminish the patient’s overall post-op experience. Isn’t it time for our pain management toolkit to catch up with our rapidly evolving surgical techniques? In the past year, Florida Hospital started shifting towards a multimodal opioid-sparing approach to pain management, anchored by local infiltration with liposomal bupivacaine (EXPAREL®). 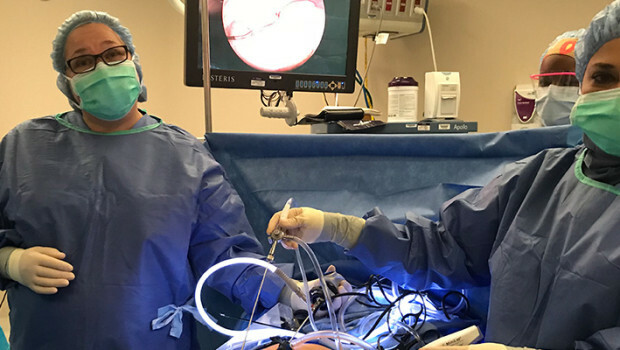 Anecdotally, we saw immediate and clear benefits of integrating direct infiltration of this medication into the surgical site as part of our routine protocols. To encourage better patient care we ran an independent, non-funded single-institution study to quantify the impact of this agent on postoperative opioid use and adverse events. During an eight-month period, we (surgeons and nurses) collected data on 82 open hernia repair and lap colon resection patients, all of whom received the “standard of care” (IV hydromorphone or morphine with or without epidurals, and/or IV acetaminophen), while 45 also received liposomal bupivacaine infiltration. The data, which found significantly lower rates of urinary retention, respiratory depression and fall risk in the liposomal bupivacaine group, helped drive adoption of long-acting local analgesia across multiple surgeons and surgical specialties within our institution. With increasing pressure from federal mandates tying reimbursement to patient satisfaction and the rate of sentinel events such as falls and urinary tract infections, hospitals will increasingly look to surgeons and anesthesiologists to identify new ways to enhance patient care by reducing avoidable complications after surgery. Based on my experience, liposomal bupivacaine will be a central fixture in the next generation pain management paradigm, where laparoendoscopic and other minimally invasive procedures transition from the exception to the norm.